The perils of dissing Creole languages in the countries where they’re spoken. Beneath Haiti’s problems lies a deep conflict with its own language. An MIT professor has a bold plan to fix that. When Michel DeGraff was a young boy in Haiti, his older brother brought home a notice from school reminding students and parents of certain classroom rules. At the top of the list was “no weapons.” And right below it, DeGraff still remembers: “No Creole.” Students were supposed to use French, and French only. It was like this all over the country, and still is. Despite the fact that the vast majority of Haitian children grow up hearing and speaking exclusively Haitian Creole–the language used in their villages and homes, in their music, and in their proverbs, jokes, and jingles–the minute they start school they are forced to start all over in a language they don’t know. French is the language of Haiti’s tiny ruling class, and for children who come from that world, this poses no problem. But for all the others, being forced to use French makes it nearly impossible to learn. Many students just stop talking in class, going silent. And according to an estimate from the Ministry of Education, less than a third of students who enter first grade reach sixth grade, and only 10 percent of those who start high school pass the exam that is given at the end…. Until this reality changes people are going to think that the best way to advance in such societies is to lighten your skin colour. People can fulminate all they want and express litres of outrage, it will make no difference. To me bleaching your skin is fundamentally no different from deciding that Creole /Patwa , if that is your mother tongue, is so lowly and contemptible linguistically that it is not worthy of being spoken or allowed in schools. Edouard Glissant described how in Martinique it was common to see “In beautiful rounded white letters on a clean blackboard at the reopening of school: it is forbidden to speak Creole in class or on the playground.” And Jamaica is no different. The logic is the same: English/French/Spanish is the language of universal currency so our children must only learn English and must actively be discouraged from speaking Jamaican or Patwa, the versatile, volatile language of the streets here that for many is their native tongue. Similarly skin bleachers reason that since white/light skin is almost universally valued higher than darker skin tones, they must use any means necessary to acquire it. I find this kind of logic depressing. It’s as if to say that if your mother happens to be a poor, barely literate ghetto-dweller you must abandon her and cleave to the English missionary with her glowing white skin and impeccable English. Surely it’s not an either/ or game. Most people would agree that this was outrageous yet many of the same people would find nothing wrong with denigrating Patwa and banning it from official spaces as if it’s impossible to know and love Jamaican and also become fluent in English! The worst part is that for many children for whom Patwa is the only language available literacy becomes inaccessible because you have to know English to study any subject at school. In fact the way some people react to the idea that Patwa ought to be recognized as a language and used as a medium of instruction in schools you’d think that to promote or accept Creole is to diss English! Yes, we can…be worldbeaters! That’s the message from Jamaica’s relentlessly resilient and resourceful underclass who have proven yet again their ability to dominate global competition in the arenas where their lack of English doesn’t hold them back. This is Patwa power (patois or creole, the much reviled and disdained oral language spoken by the majority of Jamaicans) at its most potent: a lithe and flexible force–honed by adversity–flaunting its mastery of the universe of athletics. To underscore its point Patwa hurled its most powerful lightning bolt at distant Beijing. Named Usain, this young and irrepressible son of Jamaican soil then re-inscribed forever the significance of the word Bolt. 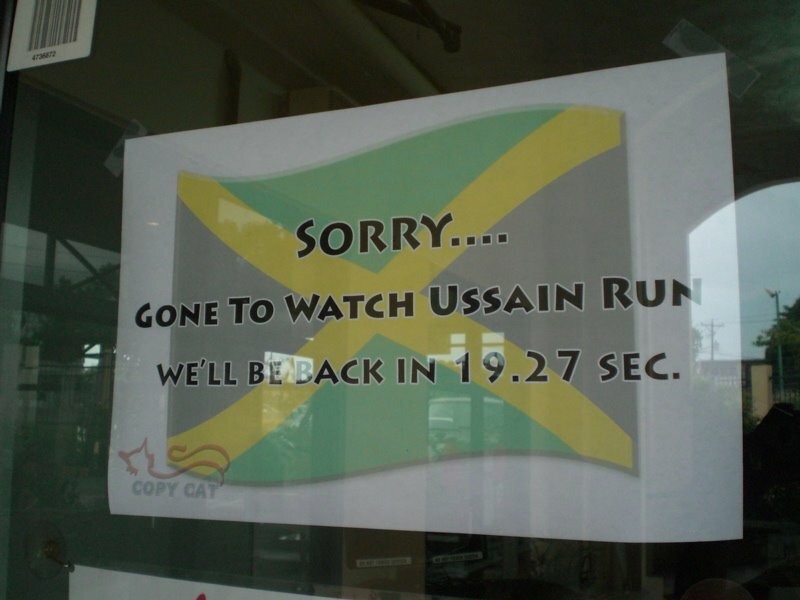 Both English-speaking and Patwa-speaking Jamaicans united in celebrating Usain Bolt’s extraordinary exploits (Gold and world records in Men’s 100m, 200m and the 4×100) and those of the nimble, determined young Jamaican team accompanying him. Over the two weeks of the 29th Olympiad they enthralled global audiences over and over again with their worldbeating skills. Haiti’s 1804 slave revolt made it the world’s first independent black republic, but French remained the official language, and persisted as the language of the island’s land-owning, well-educated elite. Today, Creole and French are both designated official languages of Haiti, but they are nowhere near equal in status. All government business is conducted in French, including all court proceedings and records of parliamentary debate. French is also the language of all formal documents, like deeds, medical records, and building permits. Road signs are written in French. So are the names of most public buildings. The two main newspapers in the country, Le Nouvelliste and Le Matin, are primarily in French, as is Le Moniteur, which publishes all new laws and government decrees. The cumulative effect is that Haitian society is sharply and conspicuously divided between the minority of people who can meaningfully participate in the official, French-driven world around them, and the majority, who can’t. Given all that, it’s not hard to see why parents in Haiti would generally expect and insist that school be conducted in French. But when it comes to what actually happens in Haitian classrooms–total and sudden immersion in French, even if it means rote, singsong memorization–that whole idea breaks down. The kids end up missing out on math, science, history, and literature. In most cases they don’t end up learning to read or write at all. And it’s not just because they can’t understand their teachers. In the tiny village schools that dot the island, many of the teachers aren’t actually fluent in French themselves. The alternative–the future that DeGraff and his allies imagine for Haitian education–is to teach kids to be literate in Creole first, building up their basic knowledge in the language they know. They can then learn French later, as a foreign language. That vision is driven in part by long-accepted research from applied linguistics and education theory, which shows that children have a far easier time first becoming literate in the language they speak. Jamaican linguists are recommending the very same thing. Can we now stop abusing them and start listening instead? This is a false comparison. The degree of traction of Jamaicans in standard English is greater than than of Haitians with French, and standard English has been indigenised in Jamaica to a considerable extent (the lyrics of Bob Marley, for example, are actually strongly engaged with standard english … “we refused to be / what you wanted us to be”, “emancipate yourself from mental slavery”, “everywhere is war…” etc etc). ..true except I suppose it’s easier for a child who grew up hearing / speaking patwa to use proper english as opposed to one who grew up speaking creole to learn/use french.. As a Jamaican who attend probably one of the best schools in the country till my migration at age 14, I really don’t remember not being able to speak either (patwa/english) very very well. One of the reasons that it strikes you as “eerily identical” may be that we like to pretend that our social issues, economic outcomes, etc., are somehow unique. If magical thinking is the act of seeing correlation and imagining it to be causation, this is reverse magical thinking, being blind to correlations that would give us better insight into how to solve our problems. Mother tongue education has been hailed by not only linguists, but UNESCO and the Kenyan government–among others–as the best means of fighting against illiteracy. Primary education in the language children speak at home not only helps children when learning basic skills (and gets them excited about education), it also reinforces the value of information passed down by relatives. Valuing and reinforcing local, cultural knowledge is a means towards valuing and reinforcing a society and a country. The one thing that makes me pause with the idea of teaching English as a foreign language here is that foreign language education here is generally poor. Not many Jamaicans learn any other language apart from English and Patwa. I suppose this is because you don’t really need anything other than English to get by in the world at the moment. Certainly from my experience though the teaching of Spanish leaves a LOT to be desired. Simply having a 30-60 minute class maybe 3-5 times a week and homework is never going to be enough. Language immersion seems to be a much better way to learn a language (since that is how you learn your first language anyway). Given the role of English in the island I would favour that as a society we move in the direction of getting both English and Patwa to be spoken at home. That way when kids go to school some of them won’t be lost in English. To get that though you need people to be conversant in both languages. To that end the ideal situation would be free, state-sponsored English classes available to all and clearer media guidelines (as it is there is currently a no rules situation so TV and radio in particular mix English and Patwa and Creolized English to such an extent (sometimes all within just one sentence) that it is little wonder that people get confused). So if they mandated that a certain amount of programming be in Patwa/Creole and a certain amount in English and that where both are going to be used in the same programme they be as distinctly used as possible (so an all-Patwa sentence or all English sentence) then maybe the next generation will have a richer background of both Patwa and English from the moment they are aware of the world. Then in the prep school and high school system there could be Patwa as the initial language of instruction for those who do not understand English to a sufficient level and then gradually the language of instruction is phased into full English (so that students become immersed in English by a certain time).So English would be taught like a foreign language to those for who it would be a foreign language initially but then it would not be completely taught as a foreign language in the traditional sense out here. Along with that method of teaching English, it would be nice if there were Creole classes (where again it would be taught as a foreign language to those for who it is a foreign language). When I think about how many places speak English based Creoles (all of the West indies, Suriname, the Bay Islands, San Andres y Providencia, most of former British West Africa, the southern United States, etc) it seems a shame that there hasn’t been a concerted effort to codify a universal Creole (and so have a Creole dictionary) whilst allowing for local variations (much like what we see in English with a basic, universal English and many local variations with unique words and so on). Certainly it would make the adjustment of going to someplace else such as Sierra Leone easier as in that particular case one could get by with both basic English and basic Creole. I’m sure it would encourage more interchange among the Creole world (both in terms of trade, culture, ideas, etc) whilst still keeping the Creole world connected to the wider world through English. Very interesting article. The suppression of traditional dialects and languages seems to go hand in hand with some form of colonial oppression of a people. It was done to many indigenous peoples of Australia, Africa and through out the Americas.